From the Baldwin County Courthouse, go west on Hancock Street for 2 blocks or 0.2 mile (or the one large block containing Georgia College & State Univ.). Turn right on Clarke Street. Go one large block or 0.2 mile. Turn left onto Highway 22 west (Montgomery St.). Go 7 miles. Turn left on Pettigrew Rd and follow one of the following directions: (1) go 0.4 mile to 403 Pettigrew and ask permission. Go 0.4 mile on the road behind this house; then turn right and go 0.4 mile to the cemetery through a cow pasture. (2) go 0.4 mile to an abandoned railroad right-of-way, which is adjacent to 403 Pettigrew Rd. Turn left on the abandoned railroad right-of-way, and go approximately 0.5 mile to a locked gate on the right side of the railway. Cemetery is located approximately 2500 ft. across the field. Ask permission before proceeding to the cemetery. On Baldwin County tax map # 036-057. 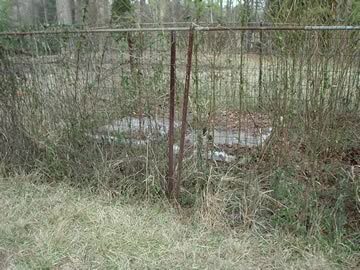 It is believed that there are a few graves outside the fence.